On Feb. 14, 2018, social studies teacher Ernie Rospierski was on the third floor of the freshman building in room 1249 when the fire alarm went off. His students began following procedure by packing their things and evacuating the room. As Rospierski reached the top of the stairs, he immediately recognized the sound of gunshots. All the students in the stairwell began running back up the stairs, and Rospierski waited at the end of the hallway drawing as many kids as he could into classrooms to take cover. He walked behind the students, yelling loudly for them to reach safety and tried to get them into a room. By the time Rospierski got back to his classroom door, the shooter had gone up the stairs and reached the end of the hallway. Upon seeing the shooter, Rospierski was unable to identify him because his face was covered by a gas mask and a vest. Rospierski finally came to terms with what was happening when one of his former students was shot and fell behind him. With students from his class still in the hallway, Rospierski frantically grabbed as many students as possible and put them into the alcove by his door to hide away from the bullets. The shooter then started aiming at Rospierski, grazing him on the cheek and hip. After another four or five shots, there was suddenly silence. Rospierski peeked his head out to get sight of the shooter and saw that the shooter was fiddling with the weapon. Recognizing the chance that this small window of time offered him, Rospierski told his kids to run towards the left stairwell and he followed behind them. He attempted covering as many kids as possible until they had all reached the stairwell. 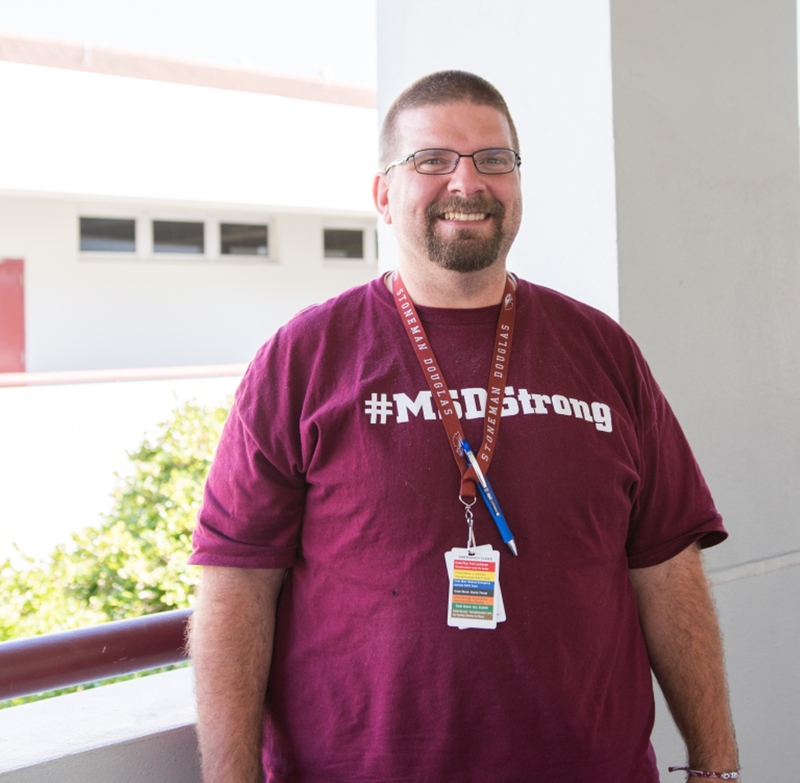 As soon as all of the students entered the stairwell, Rospierski put his foot against the door to stop the shooter from making entry and to stall for his students. Rospierski’s actions stopped the shooter from following the students down the stairs. After trying to pry the door open several times but to no avail due to Rospierski’s strength and determination to protect his students, the shooter finally gave up. No more students were injured as a result of Rospierski’s bravery. The students who ran down the west stairwell were taken by a SWAT team when they reached the bottom of the building. Rospierski only knew that his students got outside at the time, but was later informed that they had been escorted by a SWAT team. Three of Rospierski’s students were killed and another was injured. He explains that although he is processing it well, he will never feel the same again. Trying to cope with the terrible tragedy and stay in a good headspace, Rospierski has been talking to people including friends and professionals. The support of his family, especially his wife, English and AP seminar teacher Andrea Kowalski-Rospierski, has become key for Rospierski adapting back into his previous norm. Acts like Rospierski’s are what saved numerous lives at Marjory Stoneman Douglas High School on Valentine’s Day of 2018. He and many other staff and students are the reason many students returned to their families on that day. The students of MSD are beyond grateful for these people and their strong and extraordinary acts. Einav Cohen is a junior at Marjory Stoneman Douglas high school. She is the managing editor for the school newspaper, president of the MSD Politics Club, treasurer of MSD's Rho Kappa, and an officer for the school DECA chapter. Einav was born in Israel and moved to Parkland Florida as a child where she enjoys writing and learning about law.